Toronto is synonymous for food-centric neighborhoods such as Greektown, Chinatown, and lately, Ossington Avenue. But St. Clair West neighborhoods, Wychwood Heights and Hillcrest Village, spanning from Bathurst to Winona Drive, are undergoing a foodie renaissance. The St. Clair strip (near Dufferin Avenue) was predominantly known as Toronto’s other Little Italy, Corso Italia, where Italian immigrants settled after the 1950’s and flourished with grocery stores, cafes, restaurants and social clubs for their fellow countrymen. It evolved into a primo location for celebrations after Italy won the World Cup in 1982 when 500,000 revelers dominated the streets. Corso Italia still remains, but the strip a few blocks west of Bathurst are central for newlyweds, families and young professionals that have moved into the area for reasonable mortgages and a community they can call their own, away from the hustle and bustle of downtown. 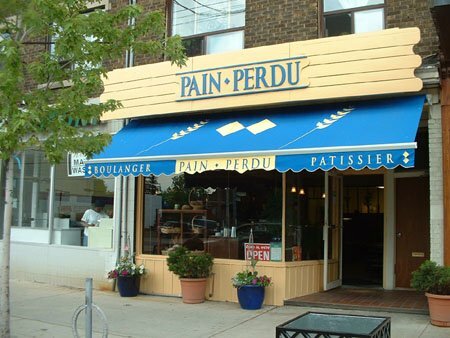 Here are a few can’t-miss eateries that are part of the local St. Clair West resident diet. 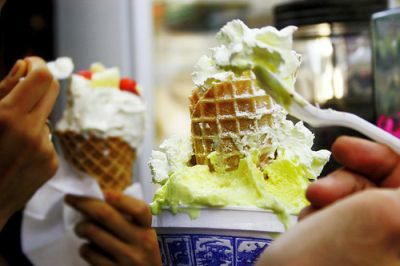 All scoops are served the Dutch way: with a dollop of whipped cream and serving of fresh fruit (strawberry, kiwi, pineapple and cantaloupe). One of the most popular flavor is Moose Droppings (vanilla ice cream mixed with chocolate fudge, chocolate chips and Reese’s Peanut Butter Cups). After a meal at one of the local restaurants such as Albert’s Real Jamaican next door, this loud and kitschy joint is ideal for an indulgent and affordable treat. Dutch Dreams, 78 Vaughan Road; (416) 656-6959. One scoop is $3.74; Waffle Scoop costs $5.93; Dutch Pancake costs $12.68; Dutch Waffle costs $11.44. Half liters cost $7.50 and full liter tubs cost $10.69. 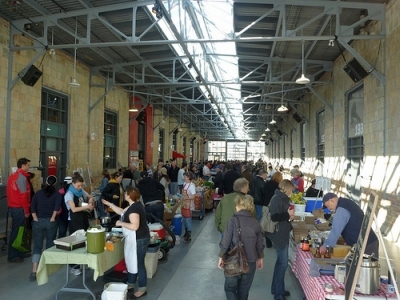 Artscape, a not-for-profit urban development organization, revitalized the dilapidated TTC Streetcar barns at Wychwood Park into a multi-faceted community center and housing project for artists in 2008. On Saturdays The Stop Community Food Centre hosts the Green Barn Farmers Market supporting and encouraging locally grown, seasonal produce. 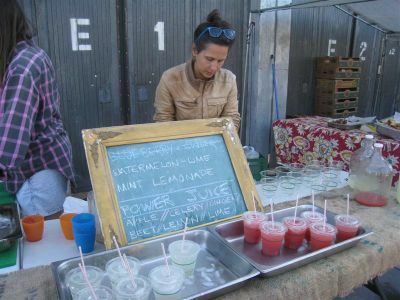 The market bustles with families feasting on the array of snack items while shopping for sustainable produce, including samosas, organic eggs with pesto sauce, and watermelon-lime lemonade. Vendors change constantly: one weekend you could be biting into mini donuts made on site; the next weekend, munching on Irish soda bread and salmon. The barns are surrounded by a small park, a great way to relax on a summer Saturday afternoon and revel in local community. The markets go indoors when the weather in the fall and winter months. Not only an example of the development of St. Clair West in the past two years, but also a destination for BBQ aficionados and carnivore fans from all over. Laid back and low key, this isn’t a place to dine in as much as it is to take out and bring with you for a hearty picnic at the nearby Wychwood Barns or Humewood Park, just north of St. Clair. It’s best to come early to pick up glazed smoked ribs and chicken, available on Tuesdays, Wednesdays and Fridays. I became a convert after indulging in the moist buttermilk fried chicken combo, served with spiced fries and a non-dairy coleslaw. 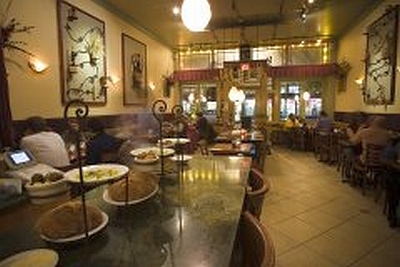 699 St. Clair Ave. W.; 416-658-9666 ; www.thestockyards.ca; $50 for dinner for two including tax and tip. 744 St. Clair Ave. W.; (at Rushton Rd. 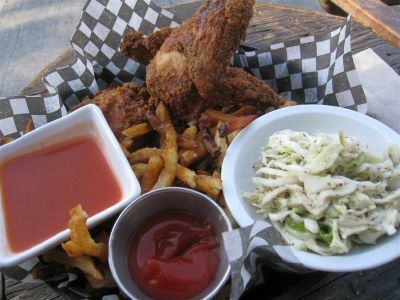 ); 416-658-0568; Entrees from $9 to $24. The baguettes and fluffy croissants at the simple, petite Basque Boulangerie are one of the best ways to transport yourself to Paris. Heartier fare include the eponymous toast with fresh berries, crème anglaise, maple syrup and fruit coulis ($7.95); homemade duck confit ($16.95); croque monsieur ($6.95); quiche ($6.95 for a slice); French onion soup ($8.95 whole); and four varieties of casse croute ($8.95). On the other hand, this is also the perfect spot to plop yourself down in the morning with a newspaper while indulging in a sculpted, rich dessert and coffee. 736 St. Clair Ave. W. (at Rushton Rd. ); 416-656-7246. Natalie Taylor is a freelance writer based in Toronto. She still has dreams of Stockyard’s buttermilk fried chicken. Natalie’s site is: natalietaylor.ca.